Ackee and saltfish recipe – This delicious one pan Jamaican national dish is made with sauteed cod, peppers, onion, tomatoes, scotch bonnet and thyme. 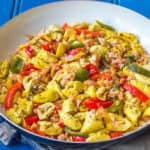 I’m so so excited and I hope you are too because Jamaican ackee and saltfish is a recipe that is true to my heart. Why you may ask? Well that’s because it’s our national dish, yes!! this amazing, flavoursome, one pan dish is finally on my website. Behold the ackee, it’s so simple to make once you grab hold of a can of ackee, I promise to make you love this dish as much as I do. Ackee is a national fruit of Jamaica which was brought to the Caribbean from West Africa in the 18th century. It is a member of the sapindaece (soapberry) family. When ripen it bears a pear shape and hue turns from red to bright yellow/orange. As the ackee fruit splits it reveals some big shiny seeds. 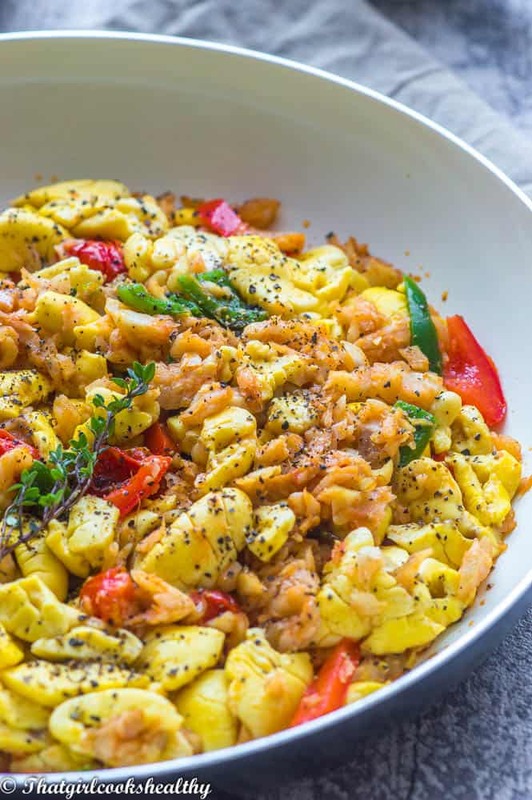 Many people who not are familiar with ackee often comment that it bears a resemblance to scrambled eggs. I can certainly see why people would say that. It has that creamy, delicate texture however, the taste is a complete contrast to eggs. 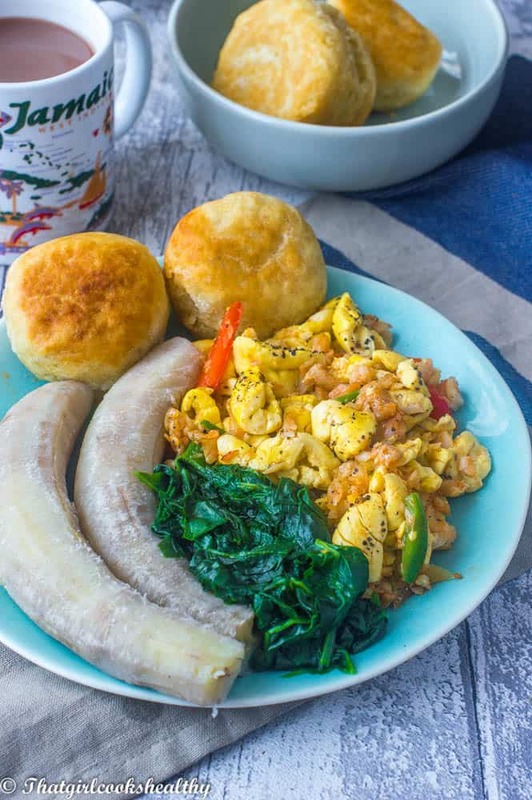 Jamaican like to eat the national dish for breakfast, lunch or even dinner and serve it with root vegetables, dumpling hard dough bread or callaloo. It depends on the individual and/or whether it’s been eaten in the morning or dinner in terms of what sides it is served with. 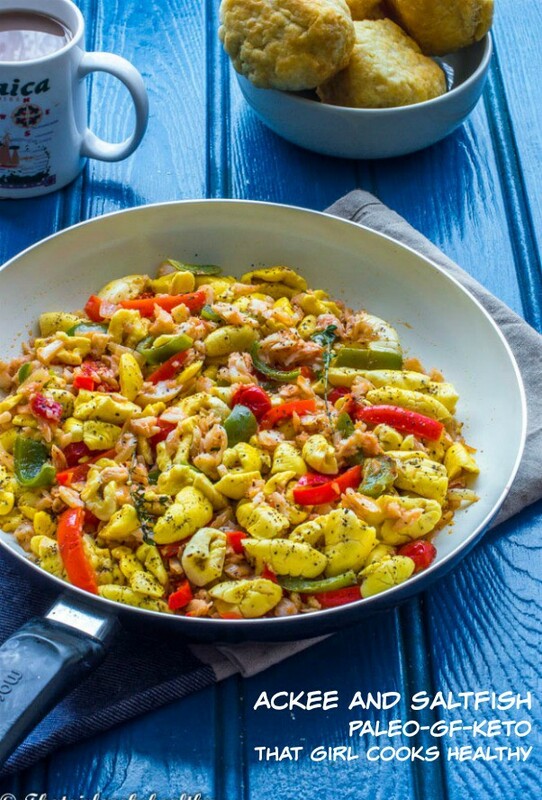 This recipe for ackee and saltfish calls for the following……..
You can purchase a can/tin of ackee from most Caribbean supermarkets. For this recipe I used a large can of ackee which serves roughly up to 4 people. Saltfish – If you aren’t using my unrefined saltfish recipe then you would need to soak and boil off the salt from the fish and de-bone (if required) before preparation. Sauteing the base ingredients – Start by sauteing the base ingredients first. I add the onion and cook until soft and then add the bell peppers. I like my bell peppers soft not crunchy so I cover the saucepan and allow the heat to soften the peppers. This takes about 5-7 minutes to achieve. Adding the saltfish, tomatoes, thyme and paprika – Once the peppers have soften I then add the thyme, saltfish and tomatoes. Simply fold them into with the bell peppers and onion and sprinkle the paprika (only need a small amount) into the skillet. Folding in the ackee – The last ingredient to hit the skillet should be the ackee. Canned Ackee is very delicate due to being preserved in water so when adding, it’s very very important not to stir too many times. What I do is pour the ackee into the middle of the skillet, then use my cooking tool to fold it, three times so it is evenly distributed. If you keep folding/stirring the ackee it won’t hold together and turn to an unpleasant mush. 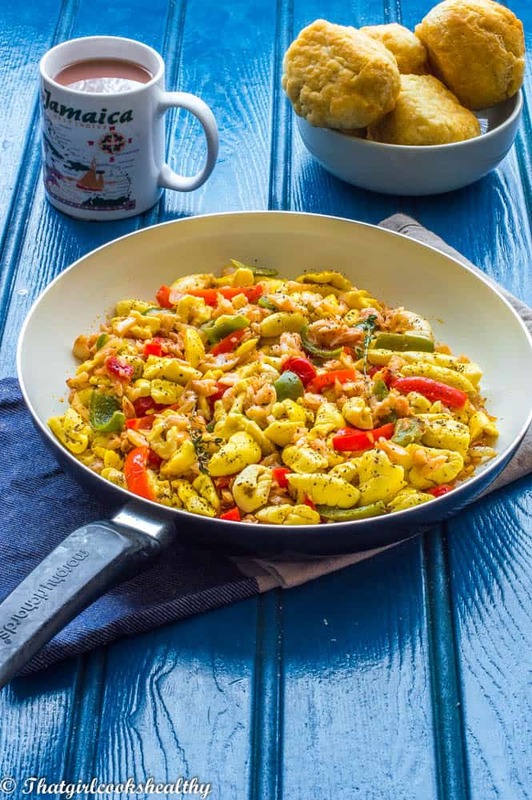 Garnishing with black pepper – some people like to add their black pepper during cooking but I grew up sprinkling the black pepper over the ackee prior to serving. It’s difficult to describe, it’s definitely not like it’s scrambled egg counterpart. I would render ackee and soft, buttery with a creamy texture paired with a mildly salted fish taste. Can I freeze ackee and saltfish? No, this is particular dish in not freezer friendly at all. Heat the oil in a skillet and proceed to saute the onion, bell peppers and tomatoes. Add the saltfish and tomato paste to the skillet and stir together. Add the thyme and scotch bonnet to the skillet, continuing to stir. Add the paprika then carefully fold in the ackee so it doesn’t turn to mush. Melt the coconut oil on medium heat. Saute the onion until soft and tender then add the red and green bell peppers. Cover the skillet, reduce heat to low and leave so the peppers soften, should take 5-7 minutes. Season the vegetables and saltfish with the paprika, scotch bonnet and stir. Pour the ackee into the middle of the skillet and carefully fold the ackee no more than 3 times into the salfish. Do not over fold/stir for the ackee will turn to mush. Reduce the heat to low, cover the skillet and allow the ackee to heat through for 5 minutes.